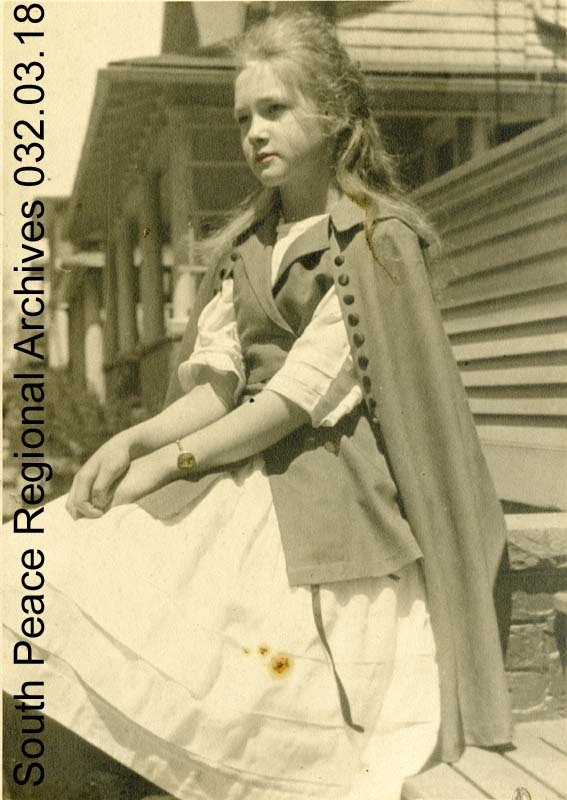 Isabel May Campbell, the daughter of Clyde and Myrtle Campbell, was born March 18, 1907 in Rock Springs, Wyoming. In 1918, Clyde joined the Army, becoming a travelling inspector of ammunition manufacturing sites. After becoming very ill with the flu and stresses of his wartime work, Clyde took his doctor’s advice to get out in the country and decided to try the Peace country, which he had seen advertised during his travels. It was not intended to be a permanent stay. However, after a 1919 visit, travelling by train, Clyde was so impressed by the quiet beauty and the potential of the land that he decided to stake a homestead claim in the Elmworth area on SE 5-70-11 W6th in April 1919. He built the cabin and Myrtle and Isabel joined him on the homestead that August. 1924 was a landmark year for the Campbells in which they proved up their homestead and became Canadian citizens. The family homesteaded for a total of nine years until 1928 when they were forced to return to Toledo, Ohio, because of Clyde’s ill health. He died in 1930. Myrtle remarried to Franklin Brewer, a former Peace Country neighbour in 1945 and returned to the Elmworth area, where she remained until her death in 1964. Isabel trained as a journalist and worked for the Bowling Green Daily Sentinel, the Daily Olympian in Washington, the State Reference Library, and the Washington State Historical Society Museum. Isabel moved back to Canada and the Peace River Country in 1951. Upon her return, she worked first at the Beaverlodge Research Station, then as a reporter for the Daily Herald Tribune, writing regular history columns such as “Down Memory Lane” and “This Was Yesterday”, even after her retirement in 1968. Isabel Campbell made numerous contributions to preserving the history of the Peace Country including featuring a daily radio program entitled “Heritage” on CJXX, gathering archival material for preservation from organizations, government, social groups, and individuals, and painstakingly indexing articles in Grande Prairie newspapers from 1913 to 1961 for research purposes. Isabel was also the first secretary for the Pioneer Museum Society of Grande Prairie and District when it was formed in 1961. Using her carefully amassed collection, Miss Campbell published Grande Prairie: Capitol of the Peace for the City’s 10th anniversary in 1968, edited Pioneers of the Peace, published in 1975, for the Oldtimers’ Association, and provided substantial information to historian J.G. MacGregor for the publication of Grande Prairie in 1983, the city’s 25th anniversary. In 1988, her father’s letters from the Peace Country to family in the United States were published in Challenge of the Homestead. Isabel was recognized for her efforts to preserve the history of the Peace Region with the Alberta Achievement Award for the preservation of history in 1983 and the George Repka Award for community contributions in arts, culture, and social areas in 1988. In 1989, she donated her historical collection Grande Prairie Public Library. The library still has an Isabel Campbell room dedicated to local history resources, although Isabel’s collections have since been transferred to South Peace Regional Archives. Isabel Campbell passed away in 1998 and is buried in the Halcourt Cemetery. A portion of her estate was willed to the Grande Prairie Museum and many artifacts from her life can be found there. Check her finding aid here for more information. Sources: Beaverlodge to the Rockies, Grande Prairie Herald Tribune, Western People, SPRA Finding Aid fonds 032, Grande Prairie Museum clippings files, Clyde Campbell clippings file.